The days the grandkids come to my house to play are usually cooking days. We love to cook together. We like to make dough, and from that we can make pizza, or cinnamon rolls, or pretzels, or we can just have fun shaping it into crazy-shaped bread. I have a very old wheat grinder that Mike’s parents bought many years ago, and one of our favorite things to do is grind wheat into flour. When our farmer Joe harvests the wheat on our farm, I always ask him to bring me a bucket or two of freshly-combined wheat. If Mike is home, he loves to gather up any of the kids that are around, and let them ride on that huge combine. (I’m not sure who has more fun!) I usually keep the wheat in the freezer to keep it fresh all year. Then it is ready for the kids to grind any time they want. It’s a fun job (though best done outside with the grinder attached to the bench of the picnic table!) We like to use about half freshly-milled flour and half all-purpose flour in our recipes. And it’s a great lesson for the little kids about where flour comes from and how bread is made. This past week was spring break for some of my grandkids so we got to spend more time in the kitchen. Nine-year-old Parker stayed with us for a couple of extra days at the Governor’s Residence in Columbus. The kitchen is equipped with some 35-year-old very sturdy Hobart appliances. Parker was especially fascinated by the built-in griddle, so after some safety lessons, Parker and I made pancakes on it. Parker loved doing it, and quickly knew when to turn the pancakes — just when the bubbles popped. For our next meal, he spread garlic butter on bread and grilled some garlic toast. He also made grilled cheese and grilled peanut butter and jelly sandwiches and French toast. Then Alana, who works in the kitchen with me, gave Parker some extra cooking lessons, which he just loved. She taught him how to pound the chicken breast, then brown it on the griddle. The next day they made kebabs with chicken and onions and pepper and pineapple which they browned on the griddle, and then put in the oven to finish cooking. Alana also showed him how to use the food thermometer and taught him the safe temperatures for the chicken. My 7-year-old grandson William is coming to visit tomorrow, so I think we might make some whole wheat soft pretzels. I know William will have fun rolling the dough out like snakes! Then he can form them into a pretzel, or into the letters of his name! They can be brushed with water and then sprinkled with salt, or for an extra treat you can brush them with melted butter and sprinkle with some cinnamon-sugar before baking. Add 2 cups of flour mixture to water mixture, stirring to make soft dough. Add remaining flour gradually. Knead 3 to 5 minutes, until elastic. Make 16 balls (golf ball size). Roll each 18 inches long. Shape into pretzel. Brush with water. Sprinkle with coarse salt. Bake at 325 degrees for 15 minutes, until lightly browned. 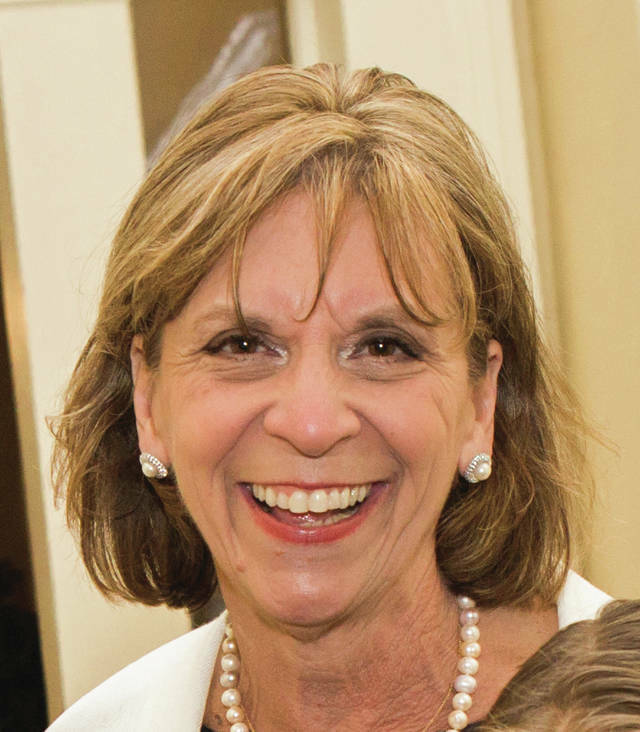 Fran DeWine is a Cedarville resident, Yellow Springs native, guest columnist and First Lady of Ohio.